The great content marketing storm has incited collaboration between agencies and brands to produce high-quality content that engages the client’s audience. Unfortunately, traditional marketers still approaching content with a “campaign” mentality may be stunting their clients’ growth. Agency teams are cranking out content left and right, but once it’s published, that content often ends up in limbo, unused. Meanwhile, clients’ sales teams aren’t aware of where or how to use that content to nurture and convert leads. If agencies want to make content work harder for their clients and demonstrate real ROI, they need to partner with an unlikely ally: the client’s sales team. Aligning clients’ content strategy and creation with the sales team’s efforts is imperative for maximizing their content’s impact and generating real results. Just look at Kapost. This content platform recognized the value in this partnership and picked up content master Jesse Noyes to team up with its sales department to produce insightful content. For this type of collaboration to work, agencies need to gain a greater understanding of the sales team’s goals and processes while educating reps on how they can use content in the sales cycle. To get salespeople comfortable with the content, agencies need to start by training clients’ sales teams to become content curators. Sales teams need to understand not only what content marketing is, but also how they can use it to educate leads. This isn’t something that can be solved with a one-time phone call or meeting. Agencies need to take an active role in training sales reps on how to identify the content they should use at each stage in the sales cycle and deliver it to leads. Once sales reps have this knowledge in their arsenal, it’s fairly easy to work content into their workflows and use their existing CRM system to facilitate the process. Again, agencies have to give their clients the tools to deliver and track consumption of the content they create. Of course, agencies can’t just storm in and start making demands of the sales team. Before they can become a true partner in the client’s sales efforts, agencies need to understand the company’s sales funnel and how content can help answer prospects’ questions at every stage of the process. That means getting in the same room with the sales team to discuss buyer personas, stages of the marketing and sales cycles, common objections, and how content can drive leads through the process. This is also a great time to retool lead scoring around new content. To get buy-in from the sales team, agencies must develop an open feedback loop so reps feel that their voices are being heard. After all, content creation should be a collaborative effort that fuels the sales pipeline with educational, purpose-driven content. Agencies can no longer afford to create content in a vacuum. To show real value, they need to remember why they’re creating content in the first place: to drive revenue for the client. Teaming up with the sales team will not only amplify results, but the unique perspectives sales brings to the table will also inspire new ideas and enhance the content creation process. Josh started out like many sales professionals, cold calling! He knew early on there had to be a better way and adopted content marketing strategies to further his career. While honing his skills with basic email marketing tools and social strategies he found and fully embraced marketing automation as a way to fuel sales success. As a former client, LeadMD was there to help him build a better sales and marketing engine during his time as the Sales and Marketing Director for a Phoenix based e-learning company. 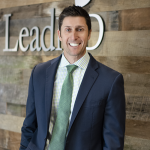 Now leading the Sales team for LeadMD, Josh brings enthusiasm and passion to helping his team and LeadMD customers accelerate revenue growth. When not "bringing home the bacon" Josh loves to spend time with his wife and their 3 funny little humans. What time is leftover is spent throwing some weight around in his garage gym.